For a renowned knight, getting the equipment right is just as important as to having the courage, the skill, and the willingness to help others. One essential part of that equipment is the horse, which is inextricably bound to the knight’s identity – indeed, what is a knight but a man with a horse? Therefore, in many medieval legends and literary works, great knights and great horses are often found in pairs; the master’s worthiness manifests in the extraordinariness of his horse. Here are five of those legendary animals. Just as Alexander the Great is a lion among man, his horse Bucephalus (‘bull-head’) is more of a monster than a horse. Born on the same day, Bucephalus is essentially a mirror image of his master. He is, according to Pseudo-Callithenes, ‘more beautiful and faster than Pegasus’, but he eats human and is absolutely untameable. For that reason, Bucephalus is put behind bars, feasting on criminals, until one day Alexander hears him neigh. Bucephalus bows before him ‘as if offering a prayer to his own ruler’. This gesture of submission signifies Alexander’s future greatness; now he has acquired an equally great horse, he is ready to embark on the journey to fulfil his destiny as the king of kings. Together, Bucephalus and Alexander venture into many untrodden parts of the world and fight many battles – including those against Nicolas, Darius, and Porus – until Bucephalus dies in the Battle of Hydaspes in 326 BC. In the Greek version of the Alexander Romance, he is shot by Porus and breathes his last. Alexander drags Bucephalus’s body out of the melee without any regard of the battle, just in case his enemies lay their hands on the horse. Although Alexander defeated Porus in the end in a single combat, Bucephalus’s death is a turning point; the conqueror is now moving towards his own end. The old man – really Odin in disguise – advises Sigurd how to choose his horse. By J. C. Dollman and published in 1909. When Sigurd, son of Sigmund the Völsung, sets out to kill the dragon and do other great deeds that form the bulk of Völsunga saga, the first thing he does is to ask for a horse from King Alf, his adoptive father. 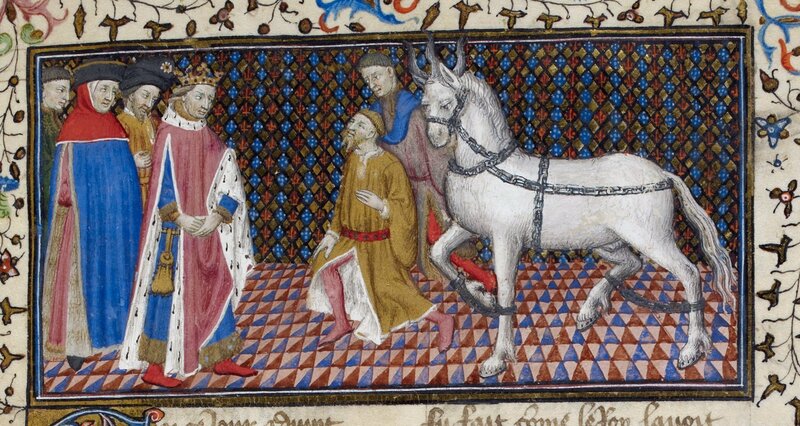 The king grants his wish and sends him to pick up a horse to his liking. On his way to the woods, Sigurd encounters an old man, who is really Odin in disguise. Together, they come to a river called Busiltjorn and find a herd of horses; they drive them into the deepest part of the stream, all swim away except one grey, young, beautiful stallion. Needless to say, that is the one that Sigurd takes. As it turns out, Grani is a descendant of Sleipnir, the eight-legged horse of Odin, just as the Völsungs trace their ancestry to the one-eyed god. That Odin gifts Grani to Sigurd echoes the earlier episode when Odin, again disguised as a strange old man, leaves a sword for Sigmund. Once Sigurd has acquired Grani, he is immediately offered the chance to kill the dragon Fafnir. When Sigurd is finally betrayed and killed, Grani just fades out of the story, never to show up again in the saga, as if he has followed his master to the world beyond the living. Llamrei and Hengeron are a pair of horses owned by King Arthur, according to the Welsh tale Culhwch ac Olwen (‘Culhwch and Olwen’) composed in the early 12th century and considered as the earliest Arthurian tale. In order to woo Olwen, daughter of the chief giant Ysbaddaden (‘Hawthorn’), Prince Culhwch is required to complete various impossible tasks – but with the help of King Arthur and his followers. One of those tasks is to obtain the blood of the witch Orddu. Four of Arthur’s attendants are captured and put in cuffs; they only manage to escape unscathed by riding on Llamrei – all four at the same time. Llamrei the mare also features in the boar hunt in the earlier episode, when they are trying to acquire the treasure hidden between the ears of Twrch Trwynt. Although it is not Arthur who rides Llamrei, she is still the first to charge. Hengreon is Arthur’s stallion. His story, unfortunately, is not told in Culhwch ac Olwen or anywhere else, but he must be as worthy as Llamrei. In the Welsh Triads, Hengreon is named as the horse that accompanies Arthur to the battlefield of Camlan. At the end of the battle, Hengroen carries St Cynwyl, a local saint of the Carmarthernshire region, out of Camlan. Guillaume d’Orange, a figure modelled on an 8th-century duke of Aquitaine named Guillaume de Gellone and the hero of four 12th-century chansons de geste, is famous for his love of horses. In battle, he takes care not to harm his opponents’ horses, so that he may capture the animals for himself. When he enters a monastery and devotes himself to God, he takes special delights in the fifteen horses he recovers from a group of robbers and even goes as far as pray to God to heal one of them (which is the only miracle in the story). One horse, however, Guillaume treasures above all – even above his sword Joyeuse, gifted by Charlemagne – and that is Baucent. When Guillaume is hard pressed in the (fictional) battle of Aliscans, he apologises to Baucent for being unable to let him rest and promises to let him ‘drink only from a golden cup’ and be groomed four times a day. Apparently, Baucent deserves Guillaume’s care, for he seldom slows down in battle and, however tired, he fights on. He listens to Guillaume’s words ‘like a man of wisdom’ and responds by a joyful neigh. The words of the master revive the horse; in turn, the high spirit of the horse encourages the master. Guillaume sets Baucent free when he obtains his opponent’s horse to try to break the Saracen line in disguise. Yet the faithful horse follows him and ends up being killed. Unwilling to have the infidels lay hands on Baucent’s body, Guillaume beheads the horse, just as Roland tries to destroy his sword when he sees all is lost.